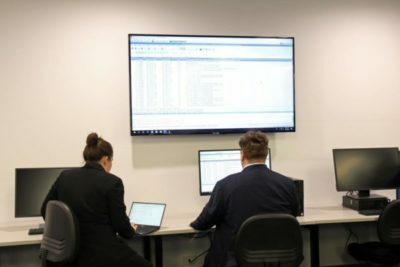 In recognition of the global need for advanced cyber security, Box Hill Institute has developed a Training Cyber Security Operations Centre (Training CSOC) that creates a realistic learning environment for effective training in incident response. According to analysis by Accenture, the average number of focused cyber attacks per organisation in Australia has almost doubled this year, yet only two thirds of companies are actively protecting against them. Australia has been facing a critical cyber security skills gap however, recent State and Federal Government support with industry and education collaboration led by Box Hill Institute, has produced improved, standardised national training being implemented across Australia. Box Hill Institute CEO, Vivienne King said, “The Australian Commonwealth Government’s Cyber Security Strategy states that strong cyber security is a fundamental element of Australia’s growth and prosperity in a global economy. “Vital for national security, cyber security requires partnership between governments, the private sector, and the community. With the rapid increase in cyber-attacks and corresponding media coverage, this threat is current and skills are required to mitigate threats,” she said. The Training CSOC will provide students with the opportunity to work in a simulated setting, designed by industry. Throughout their education, cyber security students will have the opportunity to practice work specific skills in a real world environment. Graduates will benefit from academic and industry collaboration, including Melbourne based internships as well as exposure to international experience and cyber security industry connections. The Training CSOC has been made possible by the State Government’s continuing commitment to cyber security and the strong partnership between Box Hill Institute, other internationally accredited programs and, the Victorian based cyber security industry.